The 22nd in the 50 Marriage Mondays series concerns my 6th great grandparents. No father’s names, occupations, witnesses, or the other information we expect on more recent marriage records. Fortunately, both the Raybould and Pearman families feature in the property records of Clent Manor. Property transactions were recorded in the manorial court books and the new owner, called a copyholder, was given a copy of the entry. The court official who administered proceeding on behalf of the Lord of the manor was the steward. Clent’s stewards compiled summaries of title for each collection of land parcels (called a copy), which includes the year, the person who disposed of land (by death or surrender), the person who acquired land (admitted as a Tenant), and the relationship between them. Copy no 5 shows the typical primogenitor inheritance pattern in the Raybould family. Copy no 35 shows property passed through female hands as the result of John Pearman’s will, and provides evidence that Mary Pearman married a Raybould. Notice that each date of death matches the property admittance of the heir. 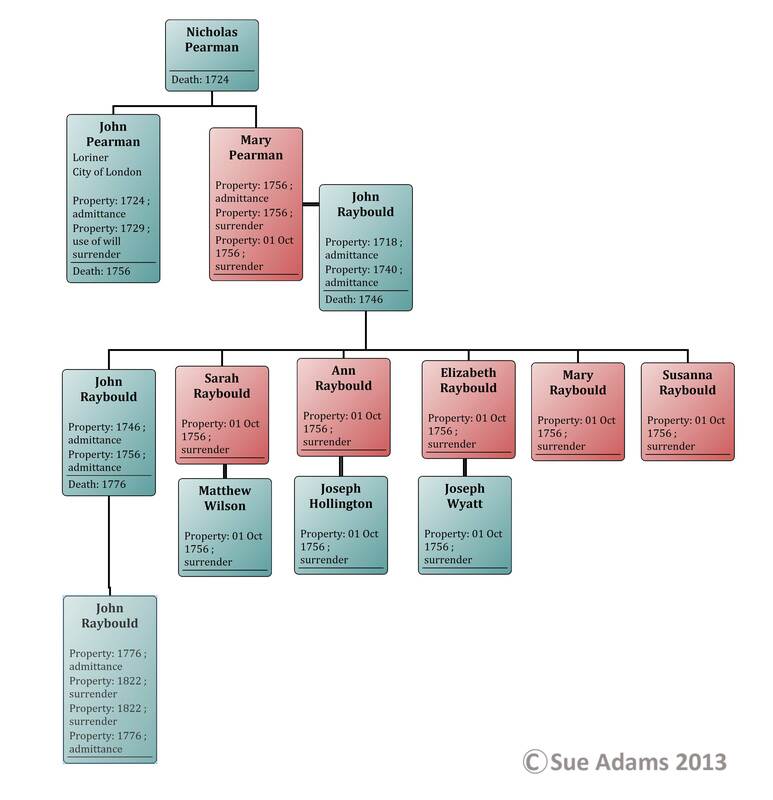 Now compare the two younger John Rayboulds on both family charts. The matching deaths and admittances is strong evidence that the son of Mary Pearman is the same person as the son of the John Raybould who died in 1746, and likewise for the grandson. Two people sharing a surname and eldest son is strong evidence indirect of a marriage. To This Court Came Mary Raybould, Widow, and also Mathew Wilson and Sarah his Wife, Joseph Hollington and Ann his Wife, Joseph Wyatt and Elizabeth his Wife, (the said Sarah, Ann and Elizabeth being first secretly examined apart from their said husbands), Mary Raybould and Susanna Raybould, spinsters, which said Sarah, Ann, Elizabeth, Mary and Susanna are five of the children of the said Mary Raybould Widow and freely consented to and surrendered unto the hands of the Lord of the said Manor by the Steward aforesaid and by the Rod according to the Custom of the Manor: All and Every the Customary Messages, Lands, Tenements and Hereditaments within this Manor of which John Pearman of the City of London, Loriner, Brother of the said Mary Raybould, Widow, died seized and which were surrendered to the use of the last Will and Testament of him the said John Pearman and now in possession of the said Mary Raybould, Widow, with all and singular and Every of their Rights Members and appurtenances. To the use and behoof of the said John Raybould of Clent within this Manor, Sythe Smith (Eldest son and heir of the said Mary Raybould Widow), his heirs and assigns for Ever according to the Custom of the said Manor. Whereupon the said Lord by his Steward aforesaid hath granted to the said John Raybould the Messuages, Lands, Hereditaments and Premisses aforesaid with the appurtenances and he hath seizin thereof by the Rod according to the Custom of the said Manor To have and to hold the same with their and every of their appurtenances To the said John Raybould his heirs and assigns for Ever according to the Customs therefore due and of Right accustomed and the said John Raybould is thereof admitted Tenant and gave the Lord for a Fine for such his admission thereof had and did his Fealty. Did you think women could not own property and therefore do not feature in property records? Widows and single women could own property in their own right. On marriage ownership of a woman’s property automatically transferred to her husband and property that she inherited or acquired after marriage also passed to her husband. Ownership of a woman’s property could be given to a third party in trust, whilst she continued to enjoy the benefits of it. Any future husband would have no claim on it. In most manors, including Clent, the eldest son inherited ownership of all property. An estate could be entailed, by either giving a life interest it the property and/or stipulating an ordered list of succession. John Pearman registered the existence his will in the manorial court in 1729. At that time, he could expect bequests to his sister Mary would pass to her husband John Raybould, then still alive, and then to his nephew John Raybould. However, by 1756 Mary was widowed so she inherited the property and was admitted tenant. John Pearman gave his nieces a stake in the property by entailing his estate. Under circumstances laid out in the will, they had the right to become the owners. The husbands of the three married nieces had rights through their wives. Consent of all parties was required for the property to be transferred free from all claims. Although the married women did not stand to become owners, they were “secretly examined apart from their husbands” to give their consent. Clearly, the family decided to avoid the complications that could arise from entailment and opted to transfer absolute ownership “in fee simple” to John Raybould, the eldest son. Church of England. Clent Parish Register 1636-1729. microfilm. Family History Library, Salt Lake City, USA. Film no 1042160, item no 8, image no 58, 22nd of 25 entries on left hand page. Manor of Clent. Court rolls. (1752-1778). Marcy, Hemingway and Son, Bewdley. 705:550/5085/5, Worcester County Records Office, Worcester. Session 1 October 1756, Case no 4. Manor of Clent. Court rolls. (1752-1778). Marcy, Hemingway and Son, Bewdley. 705:550/5085/5, Worcester County Records Office, Worcester. Session 1 October 1756, Case nos 2-3. Thank you for doing this research, Sue. It is good to know about the Raybould family. Hi, have just come across your Blog and I have information regarding the Crowther/Pearman/Wilson/Raybould/Davies families. I have a detailed screed written by an ancestor Edward Davies in 1932 and also another handwritten tree penned about 1900 by another ancestor William Crowther Umbers. The earliest information I have states a William Crowther baptised about 1690 whose son Edward Crowther took for a second wife Sarah Raybould. Sarah is my seven times Great Grandmother. Would be happy to send you my notes if you are interested…..